THE PANDEIRO LESSON…A mid summer story! As someone who’s spent the last three decades writing about music I can’t remember the amount of times I’ve been asked, “Do you play?” The answer is always, “No… I just dabble.” Inevitably, that’s always followed by, “On what instrument do you dabble?” and somewhat predictably, percussion is my first stop. Let’s face it you simply can’t dabble on a violin or a saxophone, it sounds horrendous, but when it comes to percussion, just for a moment, reflect on how many happy but deluded people you see wandering away from a festival with a freshly acquired djembe. My first attempt to master an instrument was back in the late Seventies. During a mission in Jamaica I bought a beautiful conga drum from a master drum maker called Scotty. Despite irritating the US customs I somehow managed to get the drum through the Miami transit area without them confiscating the goat skin drum head and with only one small hole drilled in it. They were looking for drugs! 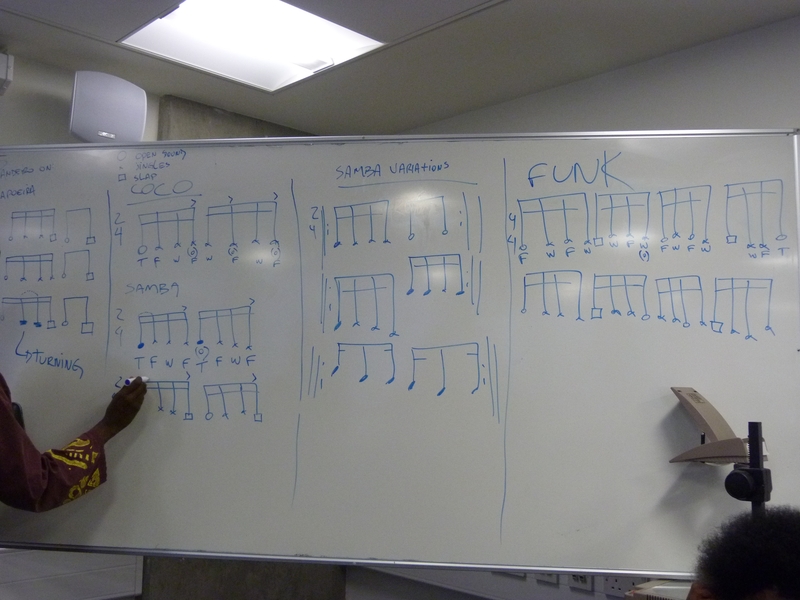 I arrived back in Hackney determined to master a few rhythms and immediately registered for a class in Finsbury Park with a Ghanaian master drummer Isaac Tagoe. I still have hazy recollections of the rhythms that Isaac hammered into us and have an enduring memory of him taking my drum at one session and playing it. It sounded amazing. He brought the drum to life and allowed it to breathe and sing. I wanted to do that. I felt I owed it to the drum. I studied diligently but as the weather got worse and worse and as I trudged through the snow, with my drum on my back, to what would be my last lesson I recognized defeat. The grand idea was no match for the discipline required. However, over the years, I seem to have appropriated lots of percussion: plastic eggs, Nigerian and Brazilian agogo bells, shekeres and caxixis. During one trip to Sao Paulo in Brasil I also snapped up a pandeiro, a tambourine like instrument which, in the right hands, can sound like a whole escola do samba. 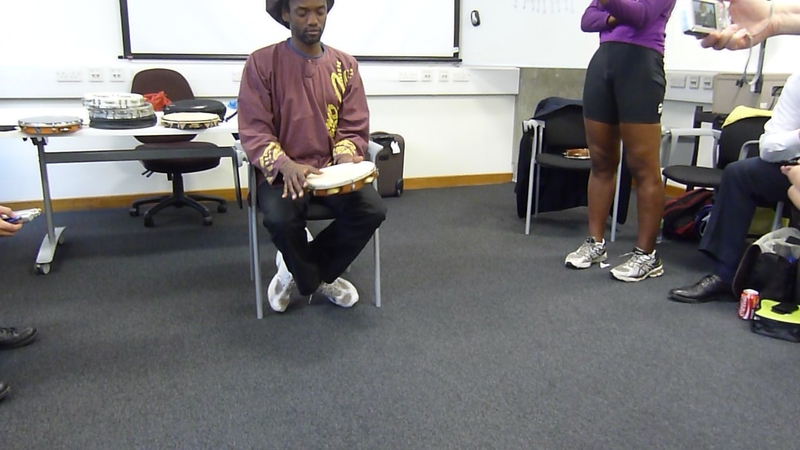 The teacher for the workshops was Adriano Adewale, a loose limbed dreadlocks who hails from Sao Paulo. Along with releasing one album of his own in 2008 he appears to be involved in a whole range of crossover projects from teaching to theatre to session work and his own band. In a tight circle the 12 plus group introduced themselves one by one. There were assorted musicians (piano, percussion, trap drums), samba and capoeira players, academics and just one music journalist! Only I and a writer/yogista/healer had never played pandeiro before. During the three hour sessions the demons inside would whisper, “You have to quit… you can’t do this! You’re just plankton feeding on disconnected rhythmic sound bites! That’s it… no tomorrow!” But each day I came back. I was supposed to be having a good time… right? And in a lot of ways I was. It was tough going but it’s about perspective. You can’t expect to play like Adriano or Airto Moreira in a couple of days! 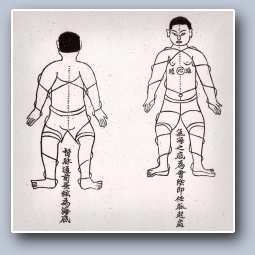 While the roda (the circle) could be stressful it was also imbued with the power of rhythm and sound and it generated a collective spirit that was always non judgemental and encouraging. Combine that with Adriano, eyes wide open and smiling, stepping into your space (and into your face) going “tun ch ch tak tun tak tun ch ch tak tun TAK…” pushing you to sing the sounds to yourself thereby connecting hand and mind, enabling you to breathe and move on … “that’s it!”. This entry was posted in Words, Sound & Power and tagged Adriano Adewale, Brasil, capoeira, coco, Marcos Suzano, pandeiro, Recife, Rio De Janeiro, samba, samba do roda, samba funk, Sao Paulo, SOAS. Bookmark the permalink.